An original letter of correspondence between Joshua Coffin Chase and Brockelman Brothers, Inc. 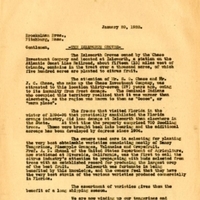 Topics discussed in the letter include the Isleworth Grove property, the 1894-1895 freeze, the varieties of citrus crops at the grove, the 1928 harvest, the irrigation system in the Lake Butler area, and the Chase packing house. Original letter from Joshua Coffin Chase to Brockelman Brothers, January 20, 1928: box 49, folder 20.84, Chase Collection (MS 14), Special and Area Studies Collections, George A. Smathers Libraries, University of Florida, Gainesville, Florida. Digital reproduction of original letter from Joshua Coffin Chase to Brockelman Brothers, January 20, 1928. The Isleworth Groves owned by the Chase Investment Company and located at Isleworth, a station on the Atlantic Coast Line Railroad, about fifteen (15) miles west of Orlando, contains in the tract over a thousand acres, of which five hundred acres are planted to citrus fruit. The attention of Mr. S. O. Chase and Mr. J. C. Chase, who make up the Chase Investment company, was attracted to this location thirty-seven (37) years ago, owing to its immunity from frost damage. The Seminole Indians who occupied this territory realized that it was warmer than elsewhere, as the region was known to them as “Ocooee”, or “warm place”. The freeze that visited Florida in the winter of 1894-95 that practically annihilated the Florida orange industry, did less damage at Isleworth than elsewhere in the State. At that time the property comprised 750 Seedling trees. Those were brought back into bearing and the additional acreage has been developed by degrees since 1904. The owners used care in selecting for planting the very best obtainable varieties consisting mostly of Dancy Tangerines, Pineapple Oranges, Valencias and Grapefruit. Prof. A. D. Shamel of the United States Department of Agriculture, now stationed at Riverside, California, was the first to call the citrus industry’s attention to propagating with buds selected from trees with an established record for producing the largest crop of the best fruit. Isleworth was fortunate in being benefited by this knowledge, and the owners feel that they have the very best strain of the various varieties produced commercially in Florida. The assortment of varieties gives them the benefit of a long shipping season. We are now winding up our tangerines and mid-season oranges and picking on our pineapple oranges. At the same time we are moving grapefruit on orders from our regular customers. Towards the end of February, 1st the First of March we start moving our Valencia oranges, and make our final shipment of grapefruit, consisting of the Marsh Seedless variety. Lake Butler is the largest, it has been possible for the owners to install an irrigating system so that water can be applied when needed, and the trees are maintained in a flourishing condition. The fruit is never permitted to become stunted from lack of water. The packinghouse is equipped with the latest and most up-to-date machinery, which includes a pre-cooling or cold storage plant. When the fruit is packed it is held twenty-four (24) hours in these rooms until all of the heat has been removed, and is then loaded into refrigerator cars at the door, thereby insuring good condition on arrival and prolonging the life of the fruit while it is in the hands of the jobber, the retailer and the consumer. All of the fruit is treated with a solution of borax which acts as a preservative and eliminates any decay germs that some times attack fruit. In the near future we will have aerial photographs of the property and expect to include one of these cuts in every box that goes forward. We appreciate the order you have favored us with thru our Boston representative, Samuel J. Shallow Company, and feel sure that when your patrons’ attention is called to the superior merits of Isleworth brand of fruit it will result in your becoming one of our very best distributors in your territory. We are now in position to take care of a limited number of straight cars of Florida mid-season oranges, pineapple oranges, grapefruit and Valencia oranges. There may be one, two, or more cars of late tangerines which will be ready for the market in February. Chase, Joshua Coffin. 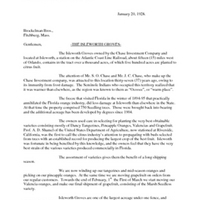 “Letter from Joshua Coffin Chase to Brockelman Brothers (January 20, 1928).” RICHES of Central Florida accessed April 18, 2019, https://richesmi.cah.ucf.edu/omeka/items/show/2699.